Business and technology alignment has become a Holy Grail for large corporations. Because these monsters are so large, anything they can do to make themselves more flexible, more responsive to their customers, is mandatory. Fortunately, as a small business you are agile and fast to respond. Chances are your top customers know how to get in touch with you at any time of the day. However, just because you do not suffer from the problems of these huge dinosaur businesses does not mean you cannot benefit from business / technology alignment. Wikipedia states "…alignment can be defined as a state where technology supports, enables, and does not constrain the company’s current and evolving business strategies. It means that the IT function is in tune with the business thinking about competition, emerging threats and opportunities, and the business technology implications of each. 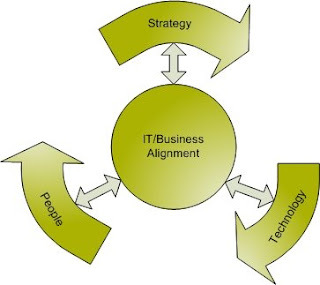 "[i] Therefore, for your business to achieve alignment means that your technology budgets must be spent to promote your overall business strategy. Historically, the IT department has been isolated from business planning. Too often, technology budgets are spent on new hardware or on perceived solutions to problems. But without the "big picture" understanding of long-term corporate goals, the IT department was unable to develop real lasting solutions to address not just the problems of today but the real business needs of tomorrow. But how do tech nerds talk to executive suits, and vice versa? How does a business owner communicate effectively with someone that speaks in tech-babble? Well, the corporate giants solved this problem by inventing the position of the CIO. "Chief Information Officer (CIO) is a job title commonly given to the person in an enterprise responsible for the information technology and computer systems. As information technology and systems have become more important, the CIO has come to be viewed in many organizations as a key contributor in formulating strategic goals. "[ii] So, the big companies just created a position that primarily amounts to a translator from Business-Speak to Tech-Babble. A good CIO should learn and understand every facet of the business. He needs to know how orders are entered into the computer system and how they are fulfilled. He needs to anticipate the likely points of failure. He needs to know the daily flow of work in order to properly perform his job. But, most are just glorified computer techs that don't mind wearing suits. Most CIO's solve every problem by throw buckets of company money at every perceived problem. The error in this approach is that the perceived problem may have deeper roots. Without a complete examination of the company and the day-to-day operations of the business, there is no way of knowing the full extents of any problem. So, while the CIO is happily throwing money at a superficial problem, the deep rooted cause of the problem remains unresolved. Then, after all the money is spent and the "solution" is implemented, the problems don't go away, they simply change symptoms. A real CIO does not just treat the symptoms but researches every level of the company and finds the real cause of the problem. Once the problem is identified, then an appropriate solution can be designed that will cure the real problem. "CIOs are increasingly being counted on to help business leaders…make their companies more agile and customer-centric. Contributing to this trend is trust in technology and the IT department to aggressively transform the business. "[iii] That is business / technology alignment. It's using computers and other information technology tools to resolve your real business problems and, at the same time, giving you the tools you need to run your business properly. I realize that most small businesses can't hire a full time CIO. In these cases, you might call him The Computer Guy, or your Business Technology Consultant. Your Business Technology Consultant should be able to help you achieve alignment, but first she must take the time to understand your business and how you work. Alignment is about giving you the answers and information you need to make the right decisions to guide your company into the future. You set the strategy and your CIO decides the tactics. Alignment is all about teamwork and communication between you and your computer guy. Innovation affects a lot of factors. You always need to adjust with the new technologies today. Knowing them can help your business in a lot of ways. Different businesses cope with the new technologies so they can have competitive advantages against their competitors.